Laurie Ceesay Art Quilts Inspire Creativity! Sometimes I am blown away by other people’s creativity. I am amazed when someone elevates a certain art to levels I never thought could be reached. I feel that way about my fellow artist Laurie Ceesay. She’s from my town, and we’ve gotten to know each other from The Old Church Gallery, where we both have our artwork. I have a wall piece of hers I have previously written about that I absolutely love. Laurie has taken the genre of art quilting to the most amazing level I could imagine. Every time I see a new quilt of hers, I am in awe of her talent! 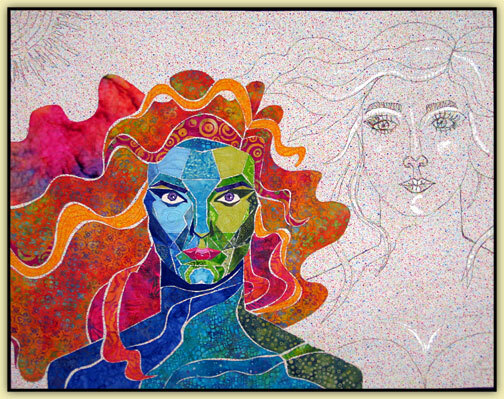 The quilt pictured above is entitled “Hera and Aphrodite” and won 2nd Place in the Marquette MI “Autumn Comforts” Quilt Show held in October of this year. You can read all about her inspiration for this piece and how she created it on her blog. I think I need to go make some jewelry now! Artsy Chick goes to Lancaster! My blog friend (we’ve never met even though we live in the same town! )Laurie Ceesay of Artsy Chick Quilts was notified that her quilted wall hanging “Violetta” has been juried into the American Quilt Society Lancaster PA Quilt Show on March 24 – 27, 2010. Her quilt is in the wall quilts – pictorial category. Unfortunately, Laurie won’t be able to be in Lancaster, but her quilt will be, so if you’re in the neighborhood, stop by the show and say hello to it! Better yet, send me a photo of you by her quilt and I’ll post it…that would be really cool and I’m sure it would help Laurie not feel so lonely! I have one of Laurie’s wall pieces, and I LOVE it. It hangs in my room and I even wrote a blog post about it. Congratulations, Laurie! Ever since I first saw this piece of fabric art collage by Laurie Ceesay at The Old Church Gallery, I have been drawn to it. Laurie’s artwork is fantastic and I love her vibrant use of color. She has recently started her own blog called Artsy Chick Quilts….check it out! Laurie is an artist from Menominee, Michigan (where I live) but she has submitted pieces nationally and gained recognition for her work. 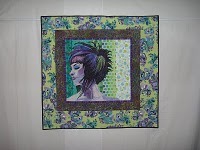 One of her pieces was published in Quilting Arts Magazine in the April/May 2009 issue as a winner of their Rock On! Reader Challenge. Her quilt featured Tina Turner and it really impressed the judges…and me! Laurie began doing her art quilts several years ago after growing bored doing traditional quilting. She likes to feature women in her work, specializing in faces. This fits right in with Laurie’s other passion – she is a hairdresser and loves hairstyles, makeup and fashion! The woman Laurie depicts in this piece is no doormat – she’s vibrant and she’s fantastic. She is who I want to be! “Fresh Picked Flowers” is coming home with me. I just know we’ll be very happy together!